While there is never a wrong choice when it comes to personal preference, there are occasions when one whiskey might make a better selection over another. 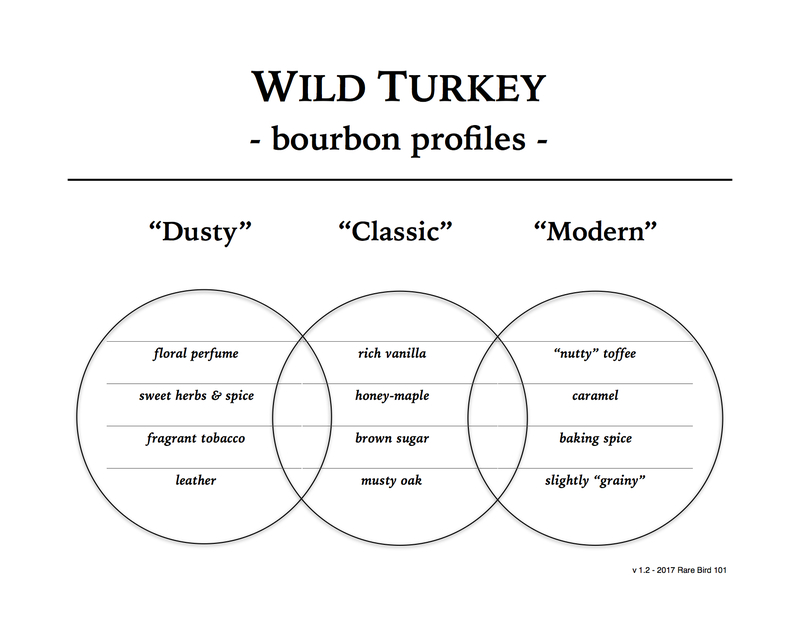 For those less familiar with Wild Turkey or Russell’s Reserve, I thought it might be a good idea to comparatively review each brand’s current flagship bourbon. While it would certainly be easier (and better – okay, I’m biased) to just buy both, that’s sometimes an unrealistic scenario when it comes to one’s budget. So with that in mind, I’ll breakdown each whiskey with a little product info and some profile notes. If you’re contemplating a future Wild Turkey purchase, maybe this article will help. And if you’re already familiar with these two expressions, you can always read along to compare notes. The far too underrated and often misunderstood Wild Turkey 101 doesn’t get near as much credit as it deserves from the average American spirits consumer. While I believe its genuine reputation is finally seeing the light of day, for years it was mislabeled by many as the whiskey of choice for old men, frat boys, and rock & roll excess. The real irony is, that if it is in fact the whiskey of choice for old men, frat boys, and rockstars, they’re drinking some of the best bourbon whiskey on the planet! While the Wild Turkey 101 label traces back to the 1940’s, the bourbon most are familiar with today took root in the 1970’s when wholesaler Austin Nichols purchased the Boulevard Distillery (now the Wild Turkey Distillery) in 1971. For years WT 101 carried an 8-year age statement and was priced for the working-class consumer. That age statement was dropped (domestically) in 1992 as more expressions were introduced under the Wild Turkey brand, but 101 continued to be an everyman’s favorite. The label design has changed a few times since, as has corporate ownership and facilities, but it remains the same classic recipe – Jimmy Russell’s classic recipe – from the same legendary distillery in Lawrenceburg, Kentucky. Overall: A very bold and uncompromising KSBW. While modern Wild Turkey 101 lacks the complexity and maturity of 101 from decades past, it has undoubtedly retained its full-flavor and spice. For some time now I’ve been critical of modern WT 101’s profile. You have to understand, as a huge Wild Turkey fan I’ve been fortunate enough to have tasted “glut era” WT 101 – whiskey from a time when distillers were pouring their most aged and coveted barrels into common retail batches. It was an act of survival – something now unnecessary, and frankly impossible, in today’s times when demand is greater than supply. So comparing 1980’s WT 101 to 2010’s WT 101 is in many ways an unfair comparison. The bottom line is that today’s Wild Turkey 101 packs a hefty dose of flavor and proof into a $25 bottle. It’s enjoyable neat (my preference), but also holds up extremely well over ice and makes fantastic cocktails. And personally, I’ve really warmed up to the modern profile over the last several months. Believe it or not, I sometimes even desire it over the classic or dusty profile WT 101. A good example is when I’m grilling out or sipping whiskey by a fire. The spicy vanilla, nutty toffee, and charred oak notes taste near-perfect when there’s smoke in the air. There’s a bourbon out there for everyone – for those that seek boldness, there’s Wild Turkey 101. In the early 2000’s, Wild Turkey decided to try something different and create a domestic brand apart from the Wild Turkey moniker. They named it Russell’s Reserve, obviously in honor of Jimmy Russell and presumably in preparation for his son, Eddie, to eventually move the brand forward. The initial 2001 release was a 10-year 101-proof KSBW that folks go absolutely insane for nowadays. How well it performed in 2001, I can’t say from experience (I’m ashamed to admit, but I wasn’t a Wild Turkey fan, nor old man, frat boy, or rockstar back then). A few years down the road in 2005, the proof was lowered to 90 and the bottle was changed to a shorter squat-style. Though the label has been redesigned a few times since, it’s the same basic bottle used today. To me, the most important thing to note about Russell’s Reserve is the impact Eddie Russell has made on the brand and its expressions. Sure, Jimmy is still in charge, but Eddie is doing things Jimmy’s way (which is to say the right way). All I can go by are interviews and industry talk, but from what I understand Eddie has been the driving force of influence for the Russell’s Reserve brand (even prior to the announcement of his Master Distiller title in 2015). If that’s true, Eddie has maintained age statements (RR 10-year bourbon and 6-year rye), and given us two new high-proof single barrel products since 2013 (RR Single Barrel bourbon and rye). Oh, and let’s not forget a phenomenal Russell’s Reserve limited edition, RR 1998, in 2015. So, let’s go back to the expression that started it all – Russell’s Reserve 10 Year Old Bourbon. While I can say from experience that the profile has changed, it’s the same recipe with the same 10-year age statement. At $35, there are very few KSBW’s that carry a 10-year age statement at 90 proof or greater – even fewer that come directly from a bona fide distillery (as many whiskeys in today’s marketplace come from NDP’s – non-distiller producers). With Russell’s Reserve, you know what you’re getting, who made it, and where it was aged. Overall: This is a hands-down solid bourbon whiskey – not too fancy and not too plain. In fact, if someone unfamiliar with KSBW asked what bourbon tastes like, Russell’s Reserve 10-year would make an ideal demonstration – even more so than Wild Turkey 101. Sure, WT 101 is an authentic staple, but it’s arguably a little too bold and spicy for an introductory bourbon. RR 10-year, on the other hand, gives you a similar core profile, yet is more finessed and approachable for the novice palate. But please don’t get me wrong. I’m not saying that Russell’s Reserve 10-year is only suited for those getting started enjoying bourbon whiskey. Mood or occasion depending, I quite enjoy it myself. If only the Russell’s (or possibly the execs at Campari) would consider bringing this expression back to 101 proof. With the entry-proof increases from 2004 to 2006 now beyond the 10-year mark, I don’t see that being a logistical challenge. But that’s another topic for another day. In Summary: If you were hoping I’d choose one flagship bourbon over the other, my sincerest apology. The truth is, there is no “one-size-fits-all” Wild Turkey whiskey. Find what works for you and enjoy it (though don’t be afraid to branch out every now and again). Both Wild Turkey 101 and Russell’s Reserve 10-year are quality purchases at their respective retail pricing. It just depends on what you’re looking for. For those chasing WT unicorns, I wish you luck dusty hunting! For those looking for the next amazing RR Single Barrel, keep tasting those private selects! And for those just wanting to unwind with a quality and affordable no-fuss sipper, have a dram of WT 101 or RR 10-year and thank me later! Special thanks to Campari and their PR firm for the bottles and the chance to review these whiskeys. Great analysis. Love Wild Turkey but Rare Breed confuses me, I keep changing my mind about it. Which batches have you tried? Rare Breed varies in profile from batch to batch. In general, the older batches are more sought after. I’ve heard batch 03-RB is Jimmy’s personal favorite. I love both tho I like , love, 101 a little more. Maybe it’s the history but it’s just perfect for me. I’m biased tho: it’s hard me to find a Wild Turkey product I don’t at least like and usually love. Great blog! Thanks Jon. I agree, 101 should be a staple for everyone!